Factory Sealed 2015/16 Panini Select Basketball Hobby Box mit 12 Packs Per Box, 5 Cards Per Pack. 3 Autogramme oder Memorabilia Cards per Box. Dazu 12 Prizms Cards, 2 Courtside und 10 Premier Level Cardds ! 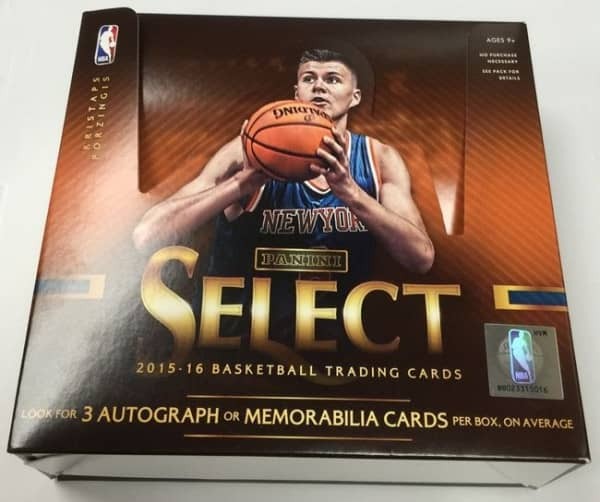 Produktinformationen "2015/16 Panini Select Basketball Hobby Box NBA"
Look for on-card autographs and prime memorabilia throughout Select! Find stunning Prizm parallels across all three base sets! On average, each box of Select delivers 12 Prizms, three of which are sequentially numbered to 249 or less! Weiterführende Links zu "2015/16 Panini Select Basketball Hobby Box NBA"
Fanbewertungen für "2015/16 Panini Select Basketball Hobby Box NBA"